Bazinga! CBS has given their new Big Bang Theory prequel series, Young Sheldon, an early second season renewal for the 2018-19 season. Thanks in part to having The Big Bang Theory as a lead-in, the single-camera comedy has been averaging a 2.36 rating in the 18-49 demographic with 12.78 million viewers. It’s CBS’ second-highest rated series in the coveted demographic. 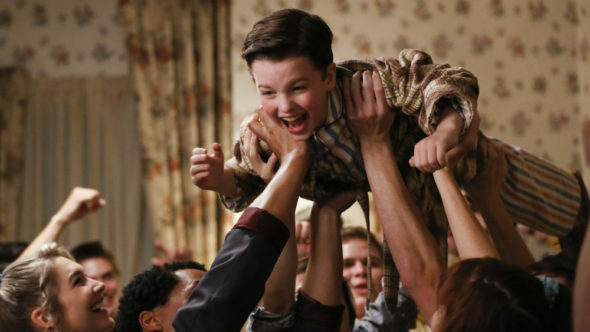 CBS announced today that the hit freshman comedy YOUNG SHELDON is the Network’s first renewal for the 2018-2019 broadcast season. The half-hour, single-camera comedy series, which stars Iain Armitage, Zoe Perry, Lance Barber, Annie Potts, Raegan Revord, Montana Jordan and the voice of Jim Parsons, follows THE BIG BANG THEORY’S Sheldon Cooper (Armitage) at the age of 9, living with his family in east Texas and going to high school. What do you think? Do you like the Young Sheldon TV show? Are you glad that it’s been renewed for a second season? Did you think that it could have been cancelled? I’m very glad Young Sheldon will continue ! Good writing, good characters/Actors. Love Raegan as the smart aleck sister. She’s going to be a gorgeous lady someday! The whole cast is so well played ! Hope this show lasts many seasons! I love the show. It is well written, funny and wholesome. It is a refreshing change from all the other shows on TV. Sheldon’s adult persona lacks many of the so-called ‘with it’ qualities. Seeing how this developed in his childhood is nothing short of brilliant writing and understanding of how clever young kids often get missed by their peers. My only regret is that after years of looking after 11-16year olds in skool I never had a Sheldon to look after. You might not love him, but you can neither hate nor ignore him and his story needs to continue. Well done CBS for keeping the faith. Love the show! Glad to hear there will be a second season. It is a wonderful spin off of the Big Bang Theory. They have brilliantly cast the roles to where you feel like you already know them with their perfect mannerisms if you know the Big Bang Theory. Keep it coming please! Every time I try to watch it I fall asleep so it must be pretty boring. It’s not boring at all. It is lively, funny, fast moving and a terrific show with interesting characters. I think it is brilliant. Love the cast and the gentle mixture of comedy and caring. Reminiscent of The Wonder Years in tone. The 24-49 year olds have no corner on this show. My partner and I are 80 and 83 and love Young Sheldon. I couldn’t agree more! My husband and I love this show and we are well into our 50’s. So glad it was picked up for another season!